Summer is upon us. Here at Hartford Manor that means outdoor BBQ, complete with cold watermelon, potato salad and corn-on-the-cob. Mmmm. The age-old problem with corn-on-the-cob is, of course, those leftover bits of corn hair (otherwise known as silk) from the husk that inevitably find their way in between your teeth, somewhat disrupting a perfect culinary experience. But now, courtesy a bit of old-fashioned magic relayed by my mother-in-law (a.k.a. Mommy #2), our corn gleams in its glorious baldness. It’s quick and easy. In fact, you’ll wonder why everyone isn’t taught this bit of kitchen know-how from an early age. First, microwave your corn with husk intact, four minutes per ear and no more. (It’s easy to over-cook corn. Better a bit under-cooked than over-cooked). Take out the corn with protective oven mittens, place on cutting board, and cut each ear at the widest part near the bottom (where the ear attached to the stalk). 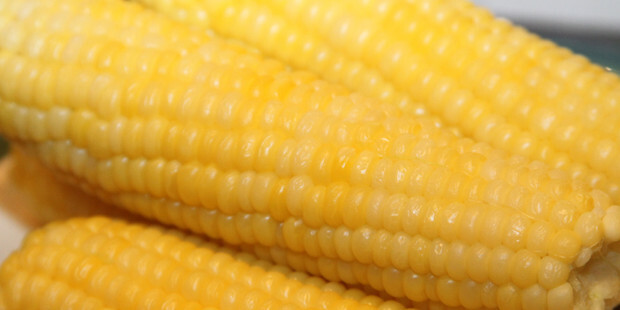 Finally, pick up the ear by the other side (the hairy side), and holding it firm, shake the corn until the cob falls out the bottom, hair-free. Simply magic. By holding the hairy end firmly, you ensure that all you end up with is yummy corn goodness. For those of you visually inclined, here’s Grandpa Ken showing us all how it’s done. Thanks Ken and Mommy #2! Top image courtesy Keith McDuffee.